"Who can enjoy her life in a foreign country, all while celebrating marriage and motherhood? 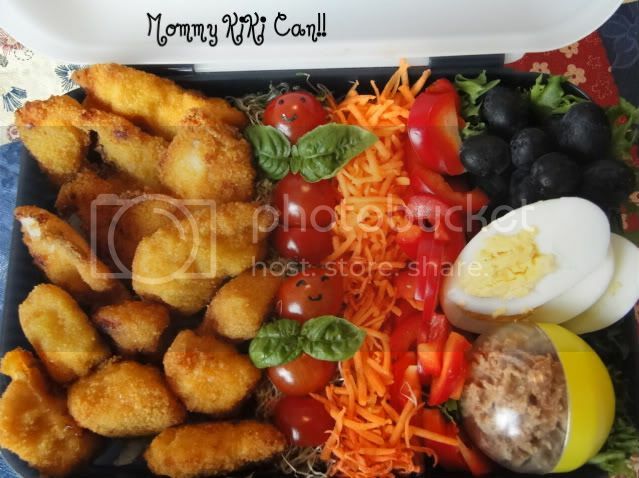 Who can?...Mommy Kiki can!" Hi I'm a southern girl from Atlanta, GA. Married to a wonderful Nordic man in south Finland. Hubby and I have two gorgeous little girls and we all live very well! I love being a stay at home mom and all the fun things that includes. It's not all work of course! 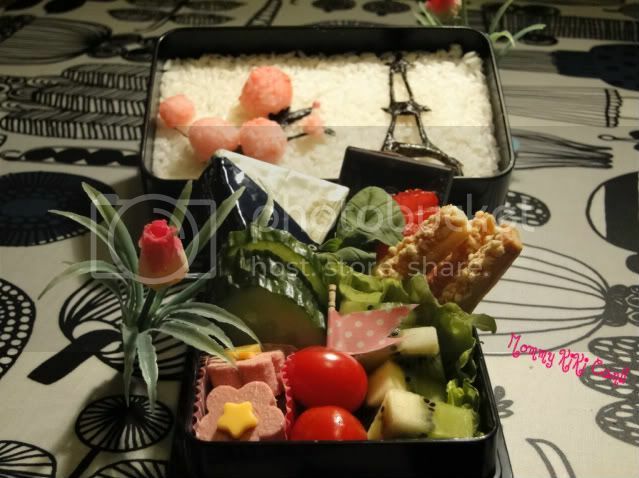 I have an intense love for bento lunches, dinner parties, tablescaping, cooking, and shopping! Un petit chou ? mon chou ? 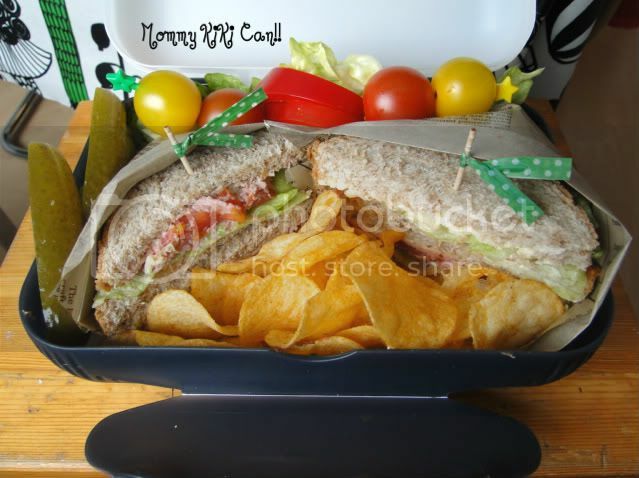 Here are a couple of lunches I've put together for Isi. I tried the spinach pie recipe from Katsbentolove.blogspot.com. It was supper good see the recipe here. Blue Cheese Salad Dressing in the green container. He had about the same today! This is a lunch from last week. Arrrgh, It's still Pirate month at Leikkikoulu! 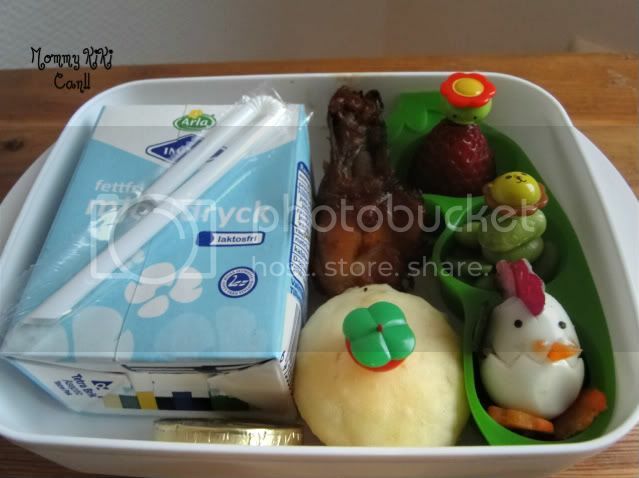 Here are a few of the snack bentos Missy Lulu has taken to playschool. Mozzarella cheese balls and two cherry tomato swords! Orange juice to drink and a chocolate gold doubloon for a treat! 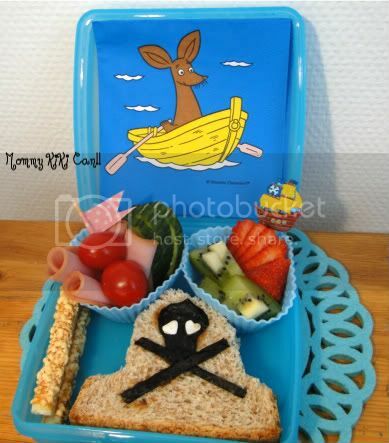 A Pirate Boy...this little guy is all over bento world, and he's been done a million times...but he's easy right? 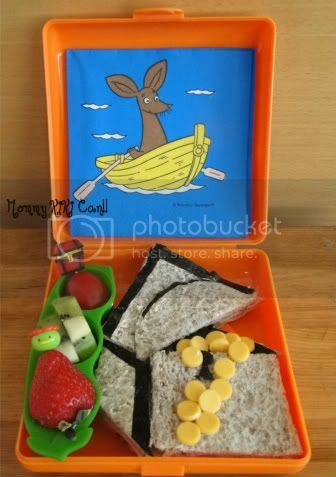 A Pirate sammie of bologna cheese and nori. Flower sammie spread with a pineapple pecan cream cheese. I've got one more pirate lunch left in me (with a lot of month left..) If any of you ladies have any Pirate theme ideas please share with me! 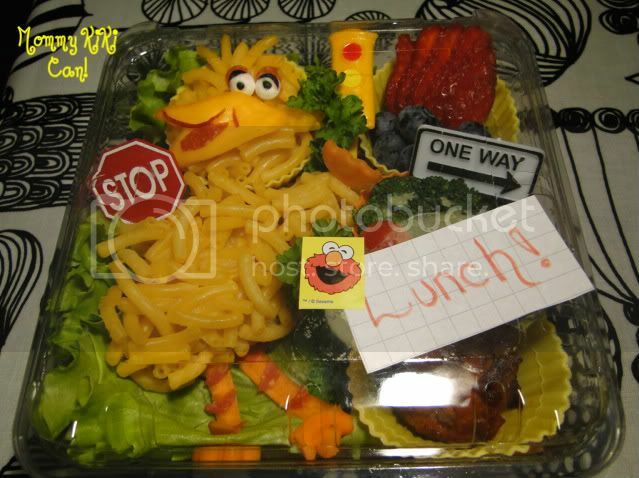 These meals are inspired by my favorite childhood show Sesame Street! I am still a fan of these characters and eagerly teach Missy Lulu who all my favorites are; since she's never seen the show! 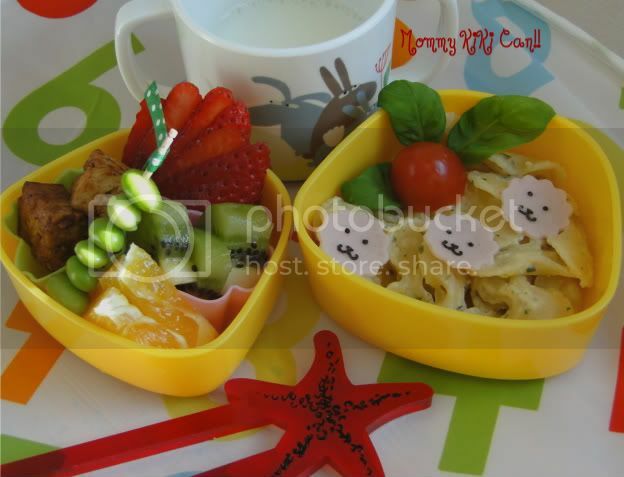 The first is her snack bento for today's playschool. Simply a banana and half a clementine orange decorated as my favorite odd couple Burt and Ernie. They are stylized with nori, food picks and pre made Wilton eyes! Some blueberries are in there as well! Note: Coming home today she told me that she didn't eat her fruit because she couldn't peel it herself. Maybe this idea would be better for a older child...even though I know a teacher would of helped her if she asked! But she ate it all after she had me peel the fruit before her lunch. 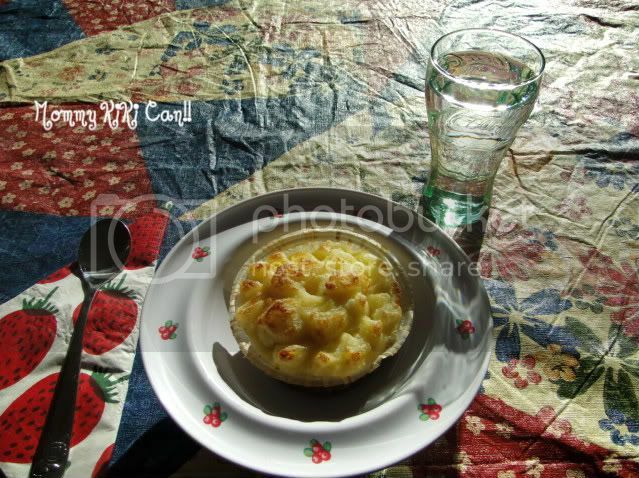 She had spinach pie for lunch, as I had just baked it for dinner. 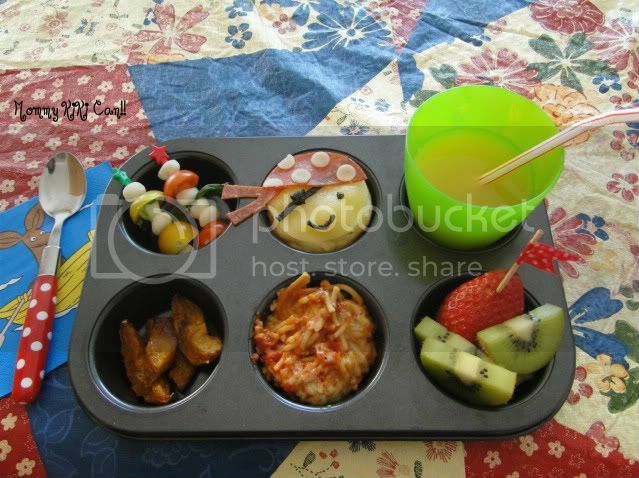 So this next meal was really saved as a bento dinner to be shared with Baby sunshine! The girls loved the dinner, which I packed in the strawberry plastic packaging. 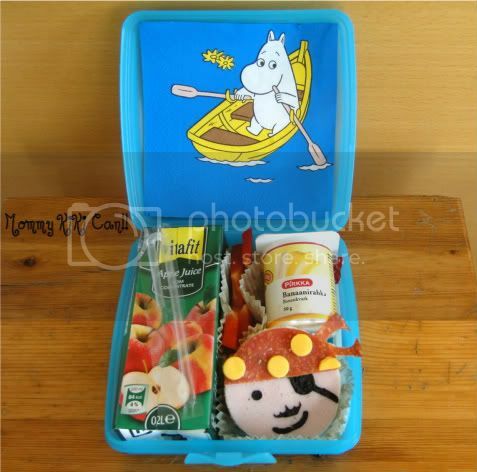 A good lesson because if you're just starting in bento making, any small container can become a bento box. All you need is food and imagination! I sometimes save the fruit packaging from the cherry tomatoes as well, because they'll be great for picnic season once the weather is warm again. 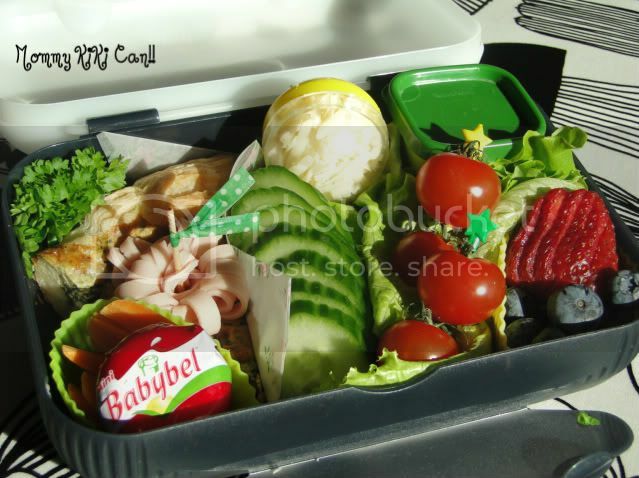 Here's the bento with the top on. 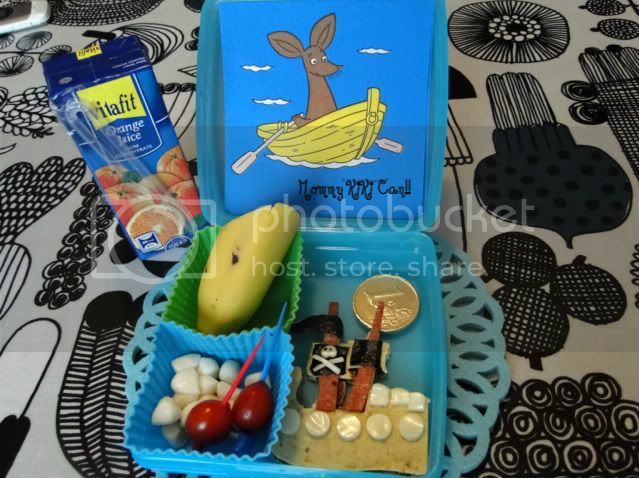 It's Pirates theme at playschool this month, so I'm making pirate theme bentos a lot this month! 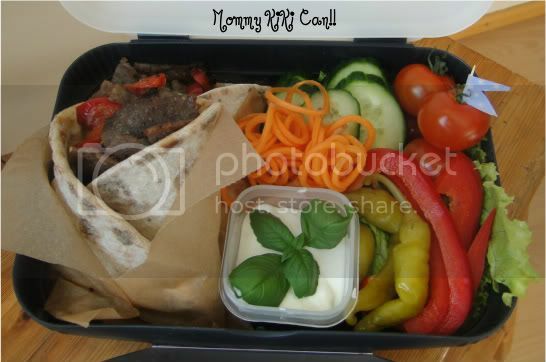 These are the bentos from yesterday and today! With this month being Pirate month at playschool everyone gets to be a swashbuckling rogue for at least a day, and today it's our favorite Kitty's turn! 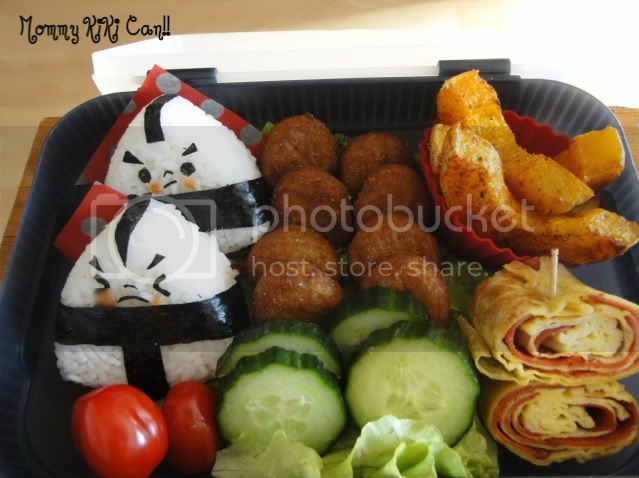 This bento is so lovely! I really like the clear top so you can see what's inside! 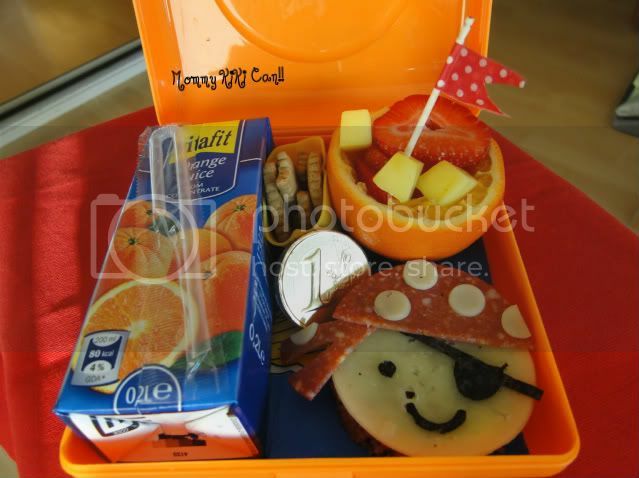 We have the wonderful theme of Pirates at playschool this month! I love Pirate lore and enjoy having a fun theme to play with! Here are some of what we've had so far. Visit again for more pirate themes! 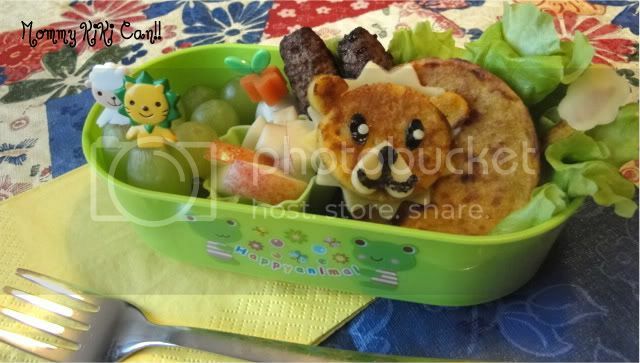 Today Isi had a Kabob bento lunch. He loves the saucy mystery meat sliced roasts sold in sandwich form, from a dozen or more Turkish restaurants found all around here. I saw a frozen package of the same stuff in our local grocery store, and decided to make his favorite take-away from home! I had planned on serving a second container of thin sliced fried potatoes with sea salt along with his meal,but he and my oldest snarfed them down in the kitchen right as I took the ringlets from the hot pan to the paper towels for draining. Lol, I did the same as a kid when my mom made them! Overall he liked his lunch! Happy Monday friends! I hope everyone had a wonderful weekend. I didn't do too much, but had a super time with my family none the less! 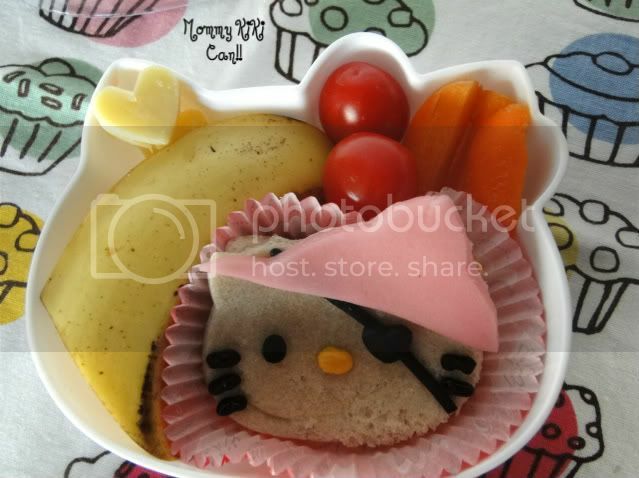 Today I'm posting my entry for Bento of the week! The theme is dogs and my favorite dog is the poodle! I created a little french lady ready for a stroll all the streets of Paris; her name's Fefe, "Ooh, la la!" Fefe made of hand cut nori and rice balls flavored with a special rice coloring...(the names in Japanese but the flavor is salmon and it's lovely pink!) 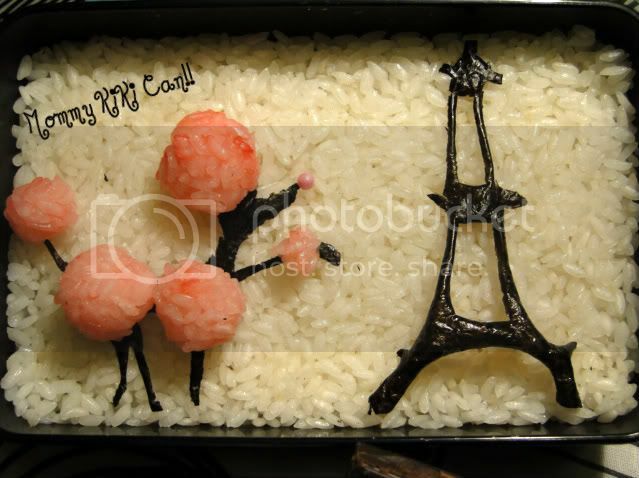 The Eiffel Tower is also hand cut nori all on a canvas of white sushi rice. A Strawberry and square of 81% dark chocolate for dessert! 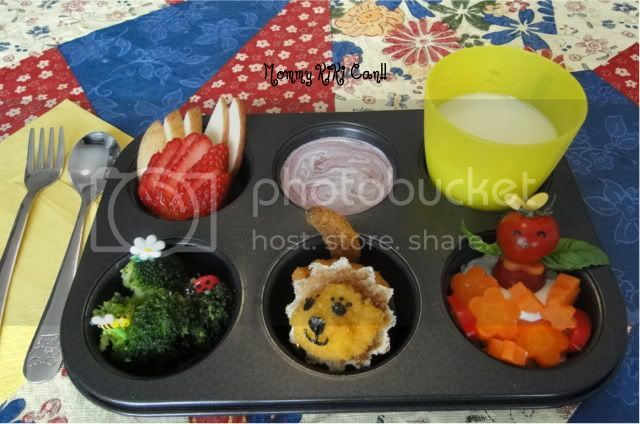 This is another bento I made for the Bento Blog Network's Bento of the week. 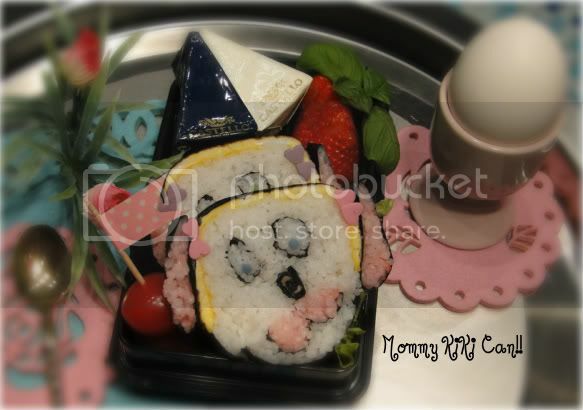 It's Sushi in doggy form...it was a practice run, but I think it came out pretty cute! These were a challenge to make, but fun! I love practicing my skills with food art! 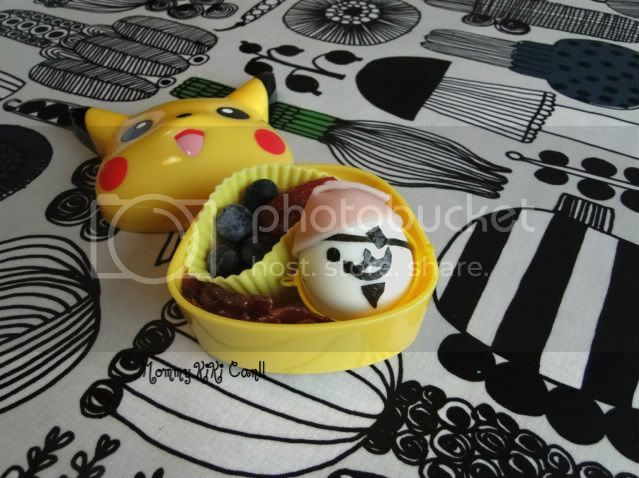 If I do these a couple of more times, I think that these will be a signature bento item. I have a huge sushi instruction book and the things you can make from it are amazing! Two Sumo onigiri stuffed with a super hot tuna, srairacha, and spring onion salad. Sliced cucumbers and cherry tomatoes! He loved this lunch...he ate all the leftover tuna mix standing in the kitchen...(was going to be my lunch '-' ) Oh, well. 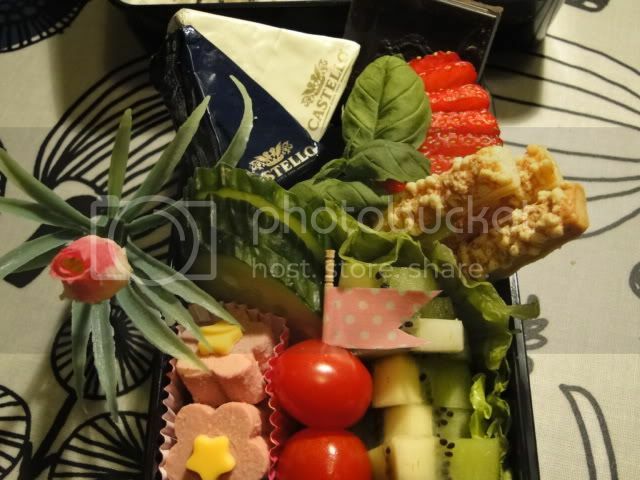 And he showed off his bento to colleagues at work! So cute! Missy Lulu has had quite a boost in her appetite lately. It's quite shocking for me to here "Mom I'm hungry!" .."You?" is my usual reply, but the Mommy in me is happy to hear it really! Lol. 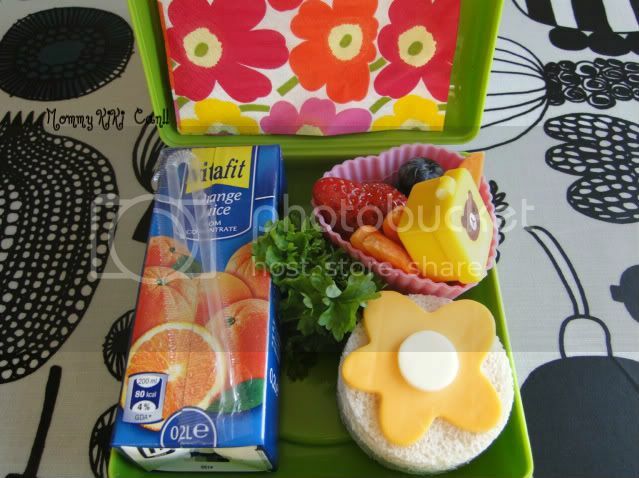 I've started making quick, smaller snack bentos for school now; and a large full lunch for her to sit at the table and have with me. 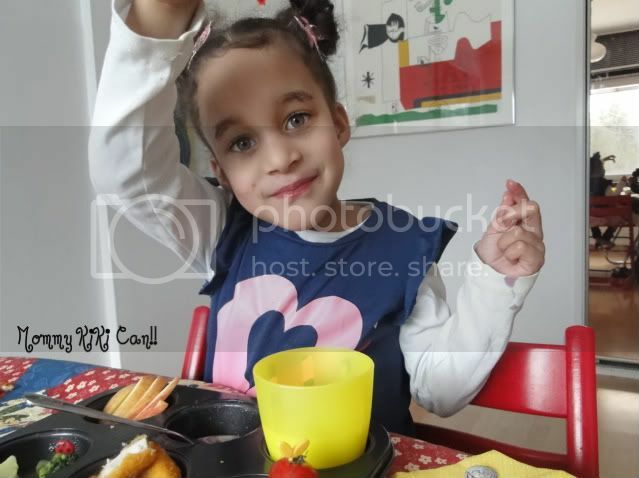 It's a wonderful change to the day because usually I had to beg her to eat what ever picked through items she didn't eat at playschool. Now the box comes home empty and she's looking for lunch! I love it! 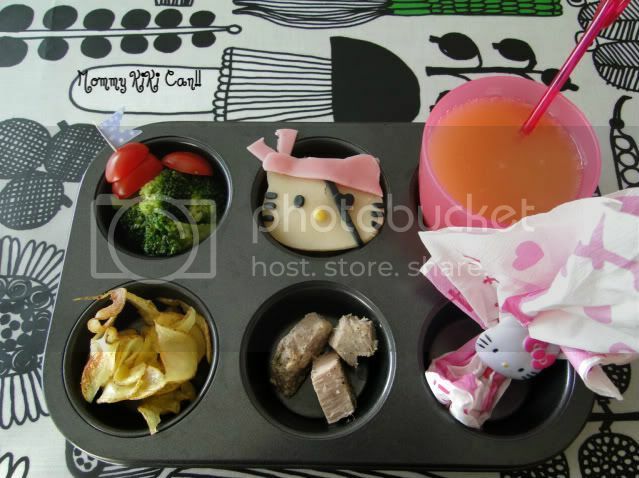 Today she had a Mickey Mouse snack bento and Muffin tin for lunch. Edamame on Mickey Mouse sticker picks. 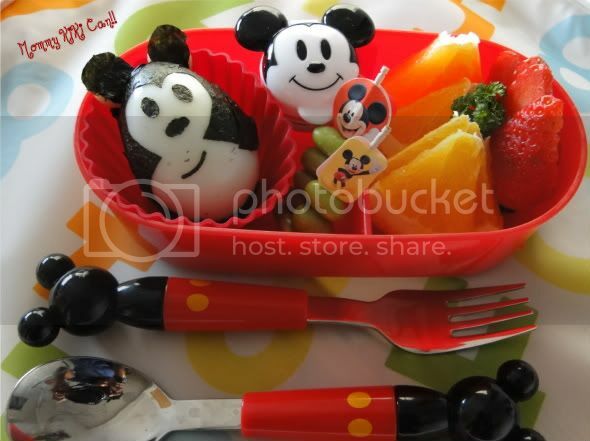 A sesame herb mix in the Mickey Mouse container to sprinkle on egg. Orange wedges and a big strawberry. 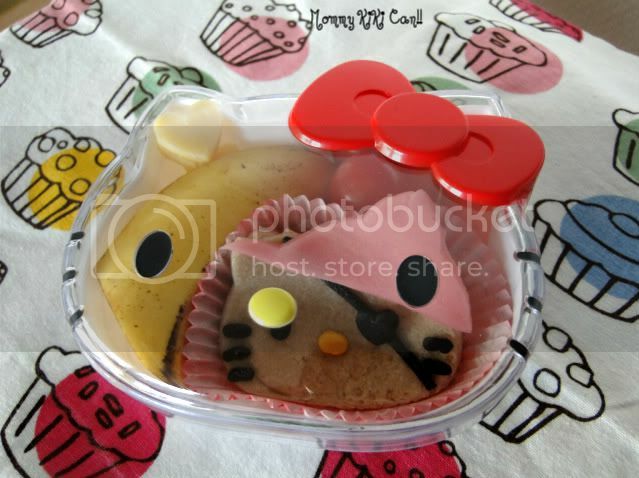 When she came home from playschool she had this muffin tin. Salmon nuggets in a lettuce cup. 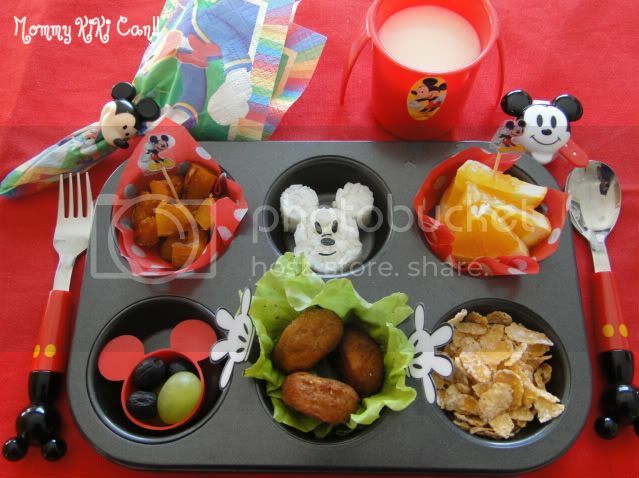 Not only did she eat the whole muffin tin, she asked me for another onigiri...(in Mickey Mouse form of course '-') I'm still in shock! On Tuesday Daddy had another vegetarian meal, barbecued tofu with a cream herb sauce topped with chopped basil. 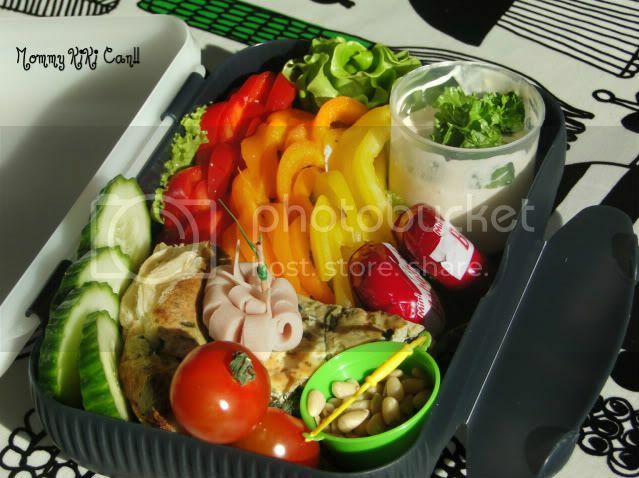 With his main entree, he had steamed broccoli, yellow cherry tomatoes, quick pickled cucumber and cabbage salad. 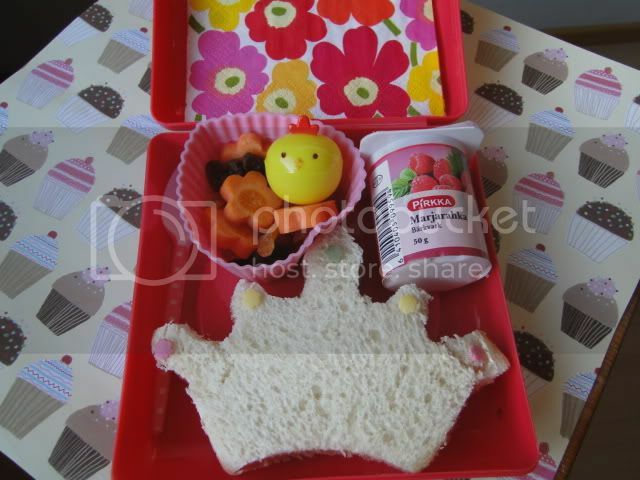 Tuesday's snack bento was a simple Bologna sandwich cut out with a crown cookie cutter. She had a yogurt, carrot flowers and raisins with her sandwich. The little chick container held little sprinkles to add to her yogurt! 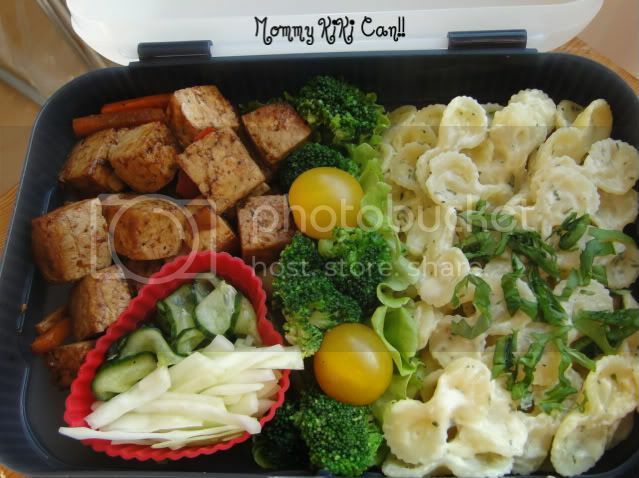 For lunch on Tuesday, Missy Lulu had bow tie pasta with a cream herb sauce, tomato and basil. Along with the pasta, there was barbecued tofu and edamame on a skewer pick. For dessert she had kiwi, orange slices and a big strawberry. I found a wonderful vegetarian blog with a months worth of healthy, tasty menus. My dear hubby is not a big meat eater and I just can't bear to be bored so this was a win win for the whole family! The menus also have each of the weeks shopping list to make all of the months meals listed...I love that! Check out the site for yourself here. 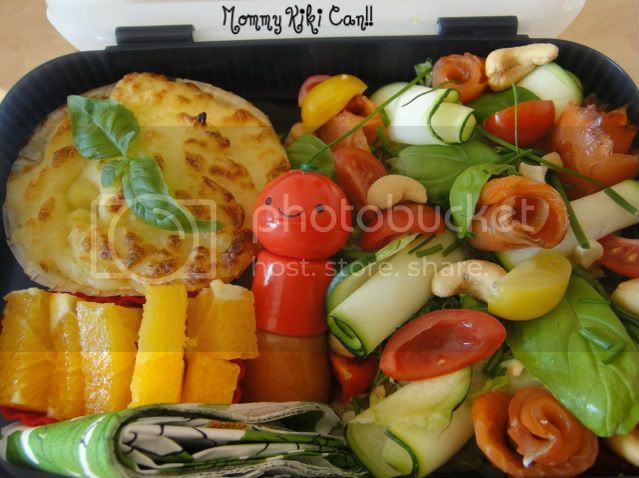 Today for lunch daddy had the Lentil Herder's Pie and a smoked Salmon salad. • In the meantime…make mashed potatoes. • Make a roux of 2 Tbl. Flour and 2 Tbl. Oil or melted butter. Add to lentils. sauce (1 Tbl), Bragg’s (1 Tbl), or even just plain salt (1/2 tsp). • Simmer until thickened. You want lentils in gravy, not soup. 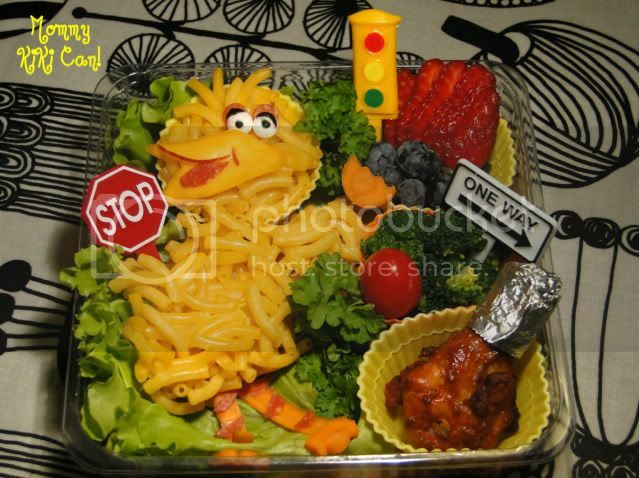 On Monday I tried to make Missy Lulu a "Oscar the Grouch" for her snack, I mean how hard could he be! From all the photo images I've seen online, nothing looks too difficult...but then why I just couldn't get his face right I'll never know! This project was a fail...but at least she ate him! 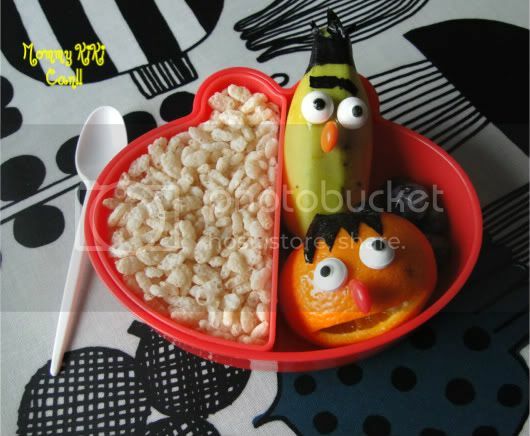 In this snack bento she had a rather pleased looking Oscar. 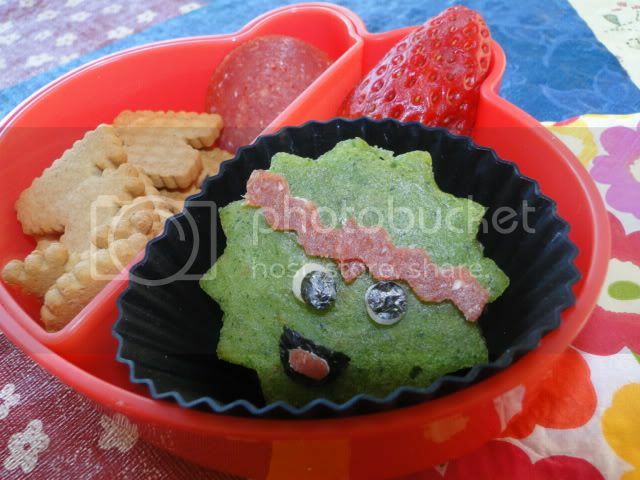 (Made from spinach pancake, pepperoni, cheese and nori details.) Along with her Oscar she had a few whole wheat alphabet cookies and a strawberry. It's nice to make one-pot meals like this, everything is all inside. Veggies like peas, carrots and leeks; also a rich protein filled lentil stew in a brown gravy sauce. Buttery mash potatoes are baked on top! My hubby loves Chicken Nugget Caesar Salad to pieces! He could probably eat it everyday for months...but he's sweet enough to eat whatever I make for him,( like the zucchini pasta with peanut butter sesame sauce from the other day!) But because he ate it all, and is open to trying all my little experiments! (Haha) I made his favorite today...again. Welcome March!! The promise of spring approaches and I have the faith, even though I'm surrounded by snow! Lol! The saying goes "If March comes in like a lion, it will go like a lamb" So though it's cold and snowy now I'm hoping for warm breezes and super sunny skies soon! So the Lion of March's arrival is today's theme! A lion pancake made from Finnish carrot pancakes. They're really soft in texture and slightly sweet. Blueberry soup with cream stirred in. She's going though a growth spurt lately because she ate so so well! I am so proud of her!